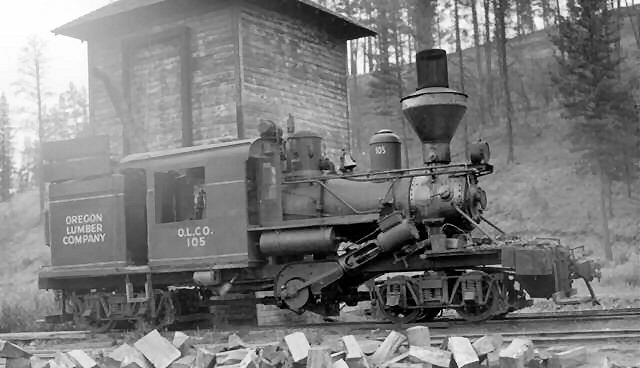 A Climax locomotive of the Oregon Lumber Company. Photographed at Bates, Oregon, July 27, 1938. The Climax is built with its cylinders in the normal place, but they were extremely tilted to allow the front truck to swivel freely. The cylinders drive a central crank shaft which on its turn drives both axles of each powered truck. The model is produced by Bachmann in 2006. It was bought in the US and flown in for me by a friend. This is clearly a model of recent date with a high level detail and a crisp clear finish. The motor drives the central crank shaft, taking the cylinders with it, using the crank shaft for real to drive the trucks. The model runs extremely slow, and extremely quiet and smooth. Although hardly visible from the outside a complete working set of valve gear is modeled between each cylinder and the boiler. Maybe a little overdone because I only discovered it after studying the exploded view in the leaflets that come with the model.